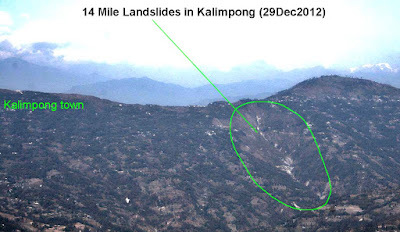 Visions of Hell: Impact of humans on landslides : 14th Mile landslides (Kalimpong) in 2002 and now (2015). Impact of humans on landslides : 14th Mile landslides (Kalimpong) in 2002 and now (2015). 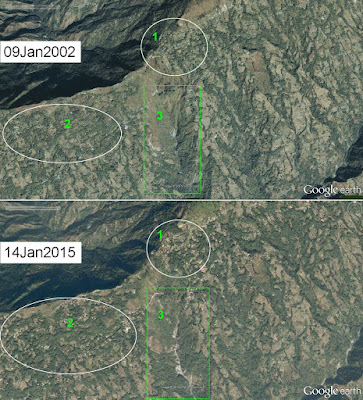 Placed above are 2 Google Earth images of the same landslide zone of 2002 and 2015. Both are photos were taken in January and the areas numbered 1 and 2 show significant increase in human habitation in the intervening 13yr period between the two photos. 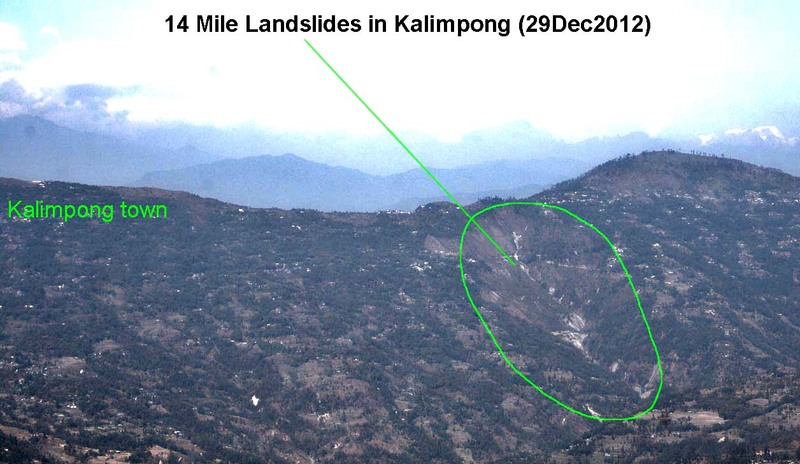 Site 3 shows the 14th Mile landslides which are much bigger in the 2015 image even though we have had deficient rainfall in Kalimpong for 3 consecutive years from 2013 ie we are seeing an increase in landslides even though there is a decrease in precipitation (rainfall data of this region for the last three years is documented month-wise elsewhere in this blog). Without being overly simplistic, as human activity grows along mountain crests, surface run-off of rain water from paved areas sharply increases the torrents of water charging the mountain streams or jhoras, leading to higher levels of erosion and landslides. Increasingly, human activity is therefore emerging as a major cause of landslides in the mountains and is undoubtedly the main trigger for all fatal landslides that have taken place in Darjeeling-Sikkim in the recent past. While it is well within our reach to control these actions and mitigate the landslides, neither the community nor the government (includes politicians) are bothered.